The first time I went to Sticks n Sushi was a memorable one. I'd gone to Wimbledon to meet a girlfriend and her gorgeous new baby and we'd chosen to eat at Sticks n Sushi. The meal was great and everyone loved the food and cocktails, but it was the sticks part of the kitchen nearly catching fire and sending thick smoke through the restaurant that stuck in the memory! Sticks n Sushi serves Japanese food and is one of the most successful restaurant groups in Denmark. They made their way to the UK in 2012 and added to their original site in Wimbledon by opening in Covent Garden in 2013. This year they've opened restaurants in Greenwich and Canary Wharf. I was invited to the Canary Wharf branch to check out the site and try some of the food, with the boy as my willing companion. We're both fans of Japanese food, and had a great time at Sticks n Sushi. Apart from the quality of the food and cooking one thing that really stands out for me is the sourcing of the fish and meat they serve - it's all responsibly sourced - they don't serve any fish on the endangered list and they ensure the fish they do serve is caught in the fairest way possible and not just hauled out of the ocean using indiscriminate, giant nets. The boy always grills waiting staff in restaurants on where they get their produce from and he was happy to hear how responsible Sticks n Sushi are. With the knowledge that we could eat anything on the menu without endangering fish species we got stuck in with the ordering. We started with 2 delicious cocktails - a Rhuby Fizz for me, made from English rhubarb liquor, gin, bitters, citrus and soda; and a the Hotaru for the boy, a long drink of rum, passion fruit and apple. My drink was sharp and refreshing while the boy's was slightly sweeter - both were excellent. Food wise we ordered lots of sharing plates, which I think is the best way to order at Sticks n Sushi. They also offer set menus if you can't choose between the options, but we went a la carte. 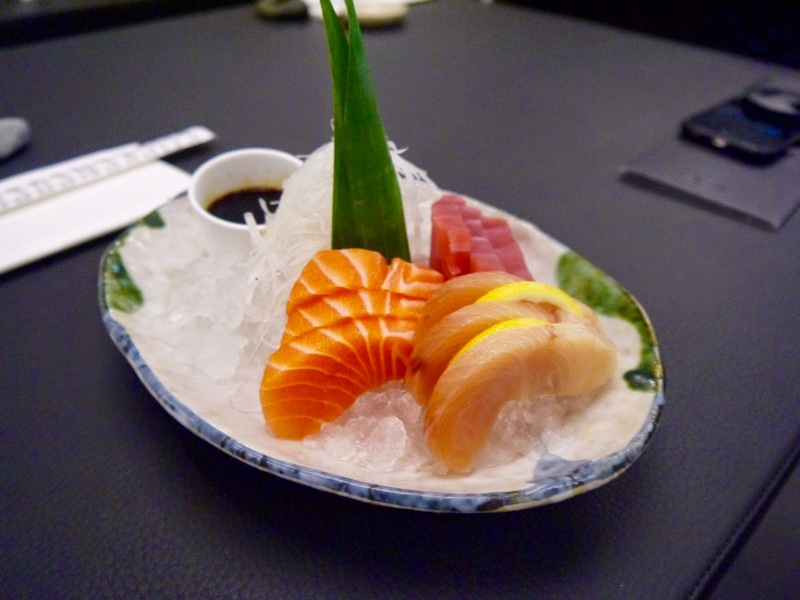 We started with some sashimi, a mixed plate of salmon, tuna and hamachi (whitefish). Fresh and clean, I could eat sashimi all the time, and it's definitely a great way to start a meal. The rest of our meal was a mixture of sushi, vegetables and "sticks". From the sushi menu we (I!) 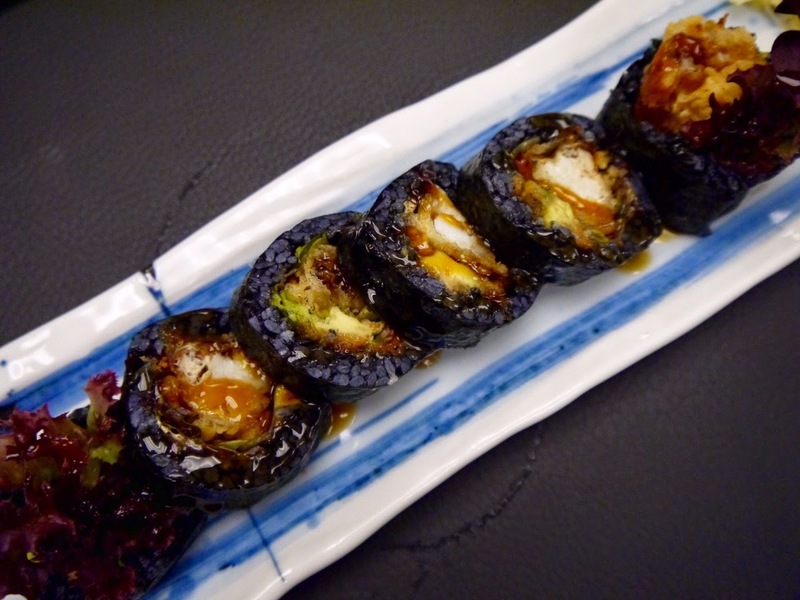 chose the coal crab futomaki (large sushi roll) which is made with soft shell crab - another favourite of mine - charcoal black rice, lettuce, avocado, masago, spicy sauce and tsume soy. The charcoal used in the rice has cleansing properties and seems to be a fashionable ingredient in Japanese restaurants at the moment. 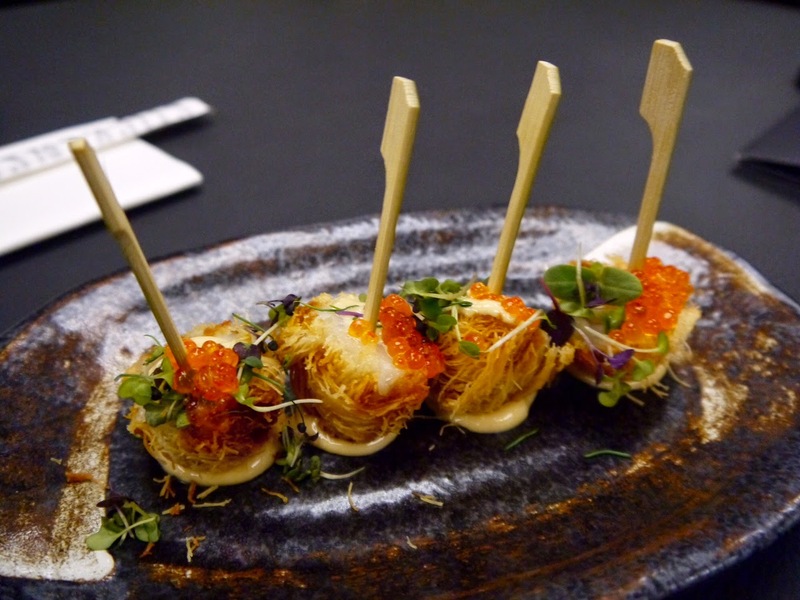 Next were the hotate kataifi bites - scallops wrapped in kataifi (shredded dough) with miso aioli, trout roe and cress. They had been fried, making the dough around the scallop crispy, and the combination of the textures of the soft scallop, crispy dough and bursting trout roe a brilliant one. 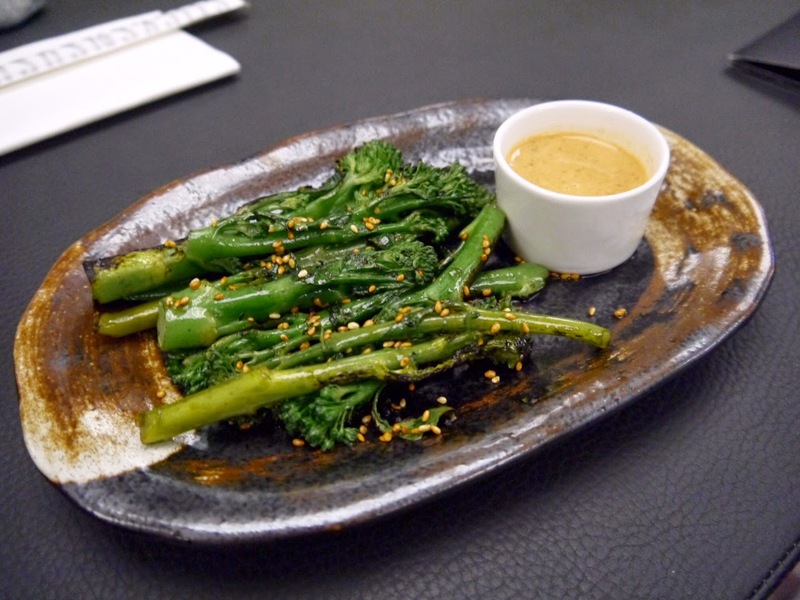 We had to have some veggies with all the meat and fish so chose a favourite from my last visit, the grilled tenderstem broccoli with spicy goma dressing. Cooked perfectly, the broccoli was crunchy and tasted wonderfully smoky from the grill. One thing to say is that the spiciness at Sticks n Sushi is limited - they list various dishes as having spice or a spicy sauce, but none of it is overly spicy. 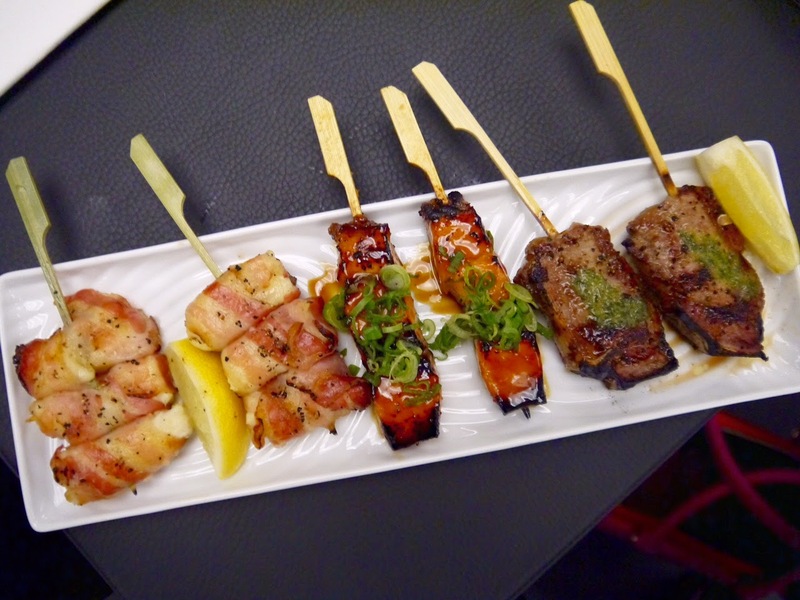 The 'sticks' at Sticks n Sushi are based on traditional Japanese yakitori sticks on which food is cooked on the grill. You can choose how many sticks you want per person/table, and we had the following: emmental cheese wrapped in bacon, not very Japanese but delicious all the same; miso marinated salmon with teriyaki sauce and spring onions; and lamb chop topped with miso herb butter that was easier to eat once removed from the stick due to the bone down the side. All were tasty and full of smoky BBQ flavours. The last two dishes we ate were 2 of my favourites on the night. 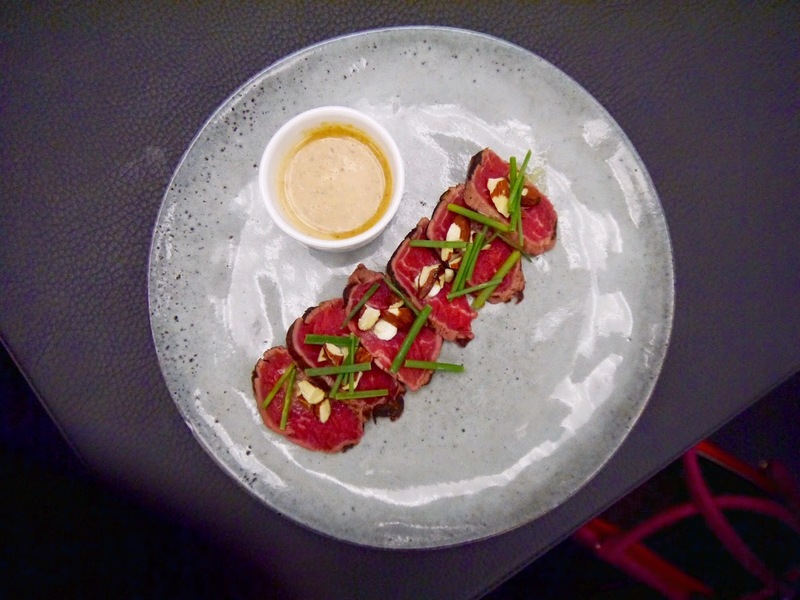 Beef tataki - seared, sliced, cold beef served with chives, yuzu dressing, soy roasted almonds and a spicy (ish) goma dressing. A light dish of quality meat topped with the crunchy almonds which make it a unique but moreish plate. 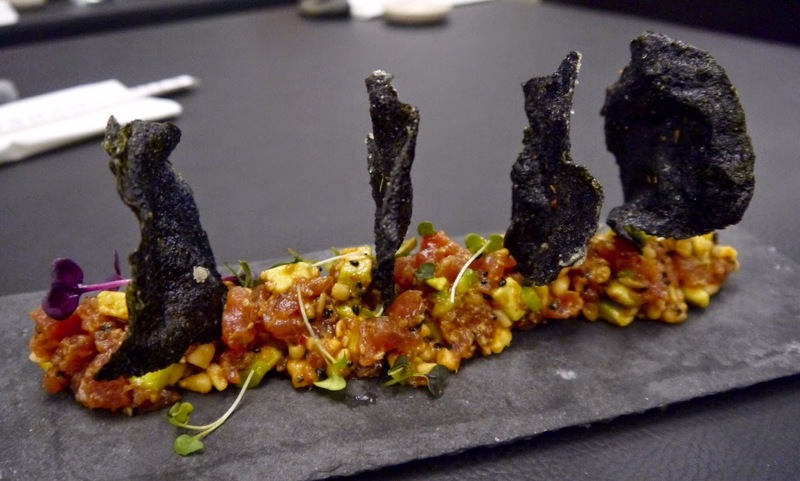 And finally, for savoury, the tuna tartare - chunks of tuna with shiso and pine nuts served with nori (seaweed) chips and miso dressing. I love avocado and tuna together and this is a great example of how well they work. Despite having eaten more than enough food we were convinced to try pudding with a coffee. It was absolutely chucking it down outside so our arms were twisted and we stayed a little longer. 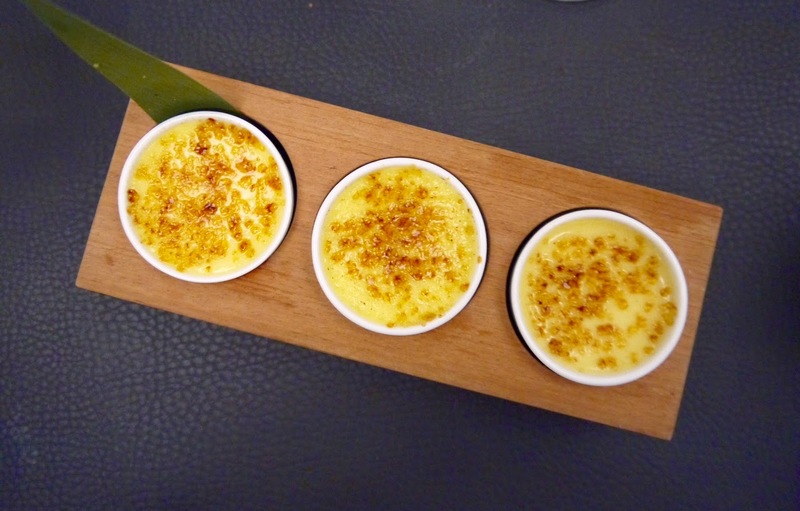 We chose the 3 crème brulees to share which come in white coffee, vanilla and bergamot, and orange flavours. All were delicious though I could've done with a harder topping on them - they needed about 3 more seconds of blow torching! All in all we had a lovely meal at Sticks n Sushi and will definitely be back. It's a great place for group meals as sharing is encouraged, so you can pick lots of items off the menu for the table and all tuck in. It's reasonably priced, with our plates for main course ranging from £4-16, and our small but nearly perfectly formed puddings coming in at £7 for 3. 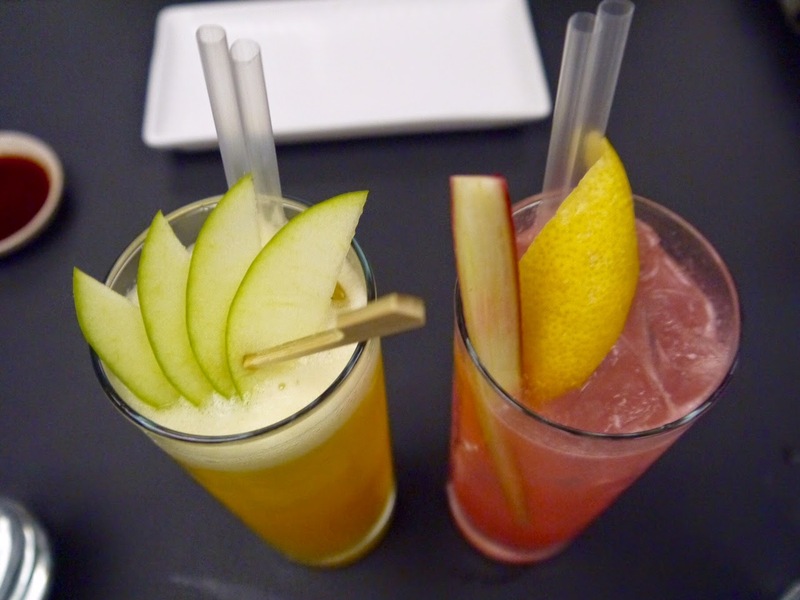 I love the food at Sticks n' Sushi but I've only been to the Covent Garden one I'd love to see the others differ. Last time I went Mr S and I ordered way too much, I think it's definitely one to go with a group! Make sure you do go, so good. You could come to London and go there one night, and one of my pop ups the next!!!! Yum! The food is presented beautifully! It's stunning, their menu is gorgeous too. So good Suze, I love that the meat and sushi is both as good as each other, definitely worth a visit! I also tried their location in Wimbledon a few weeks ago. Good food, exotic of course, delicious to be honest. And great location.